Sasquatch Eats a Hoosier Banana? A Pawpaw! C’mon, Readers, A Pawpaw! 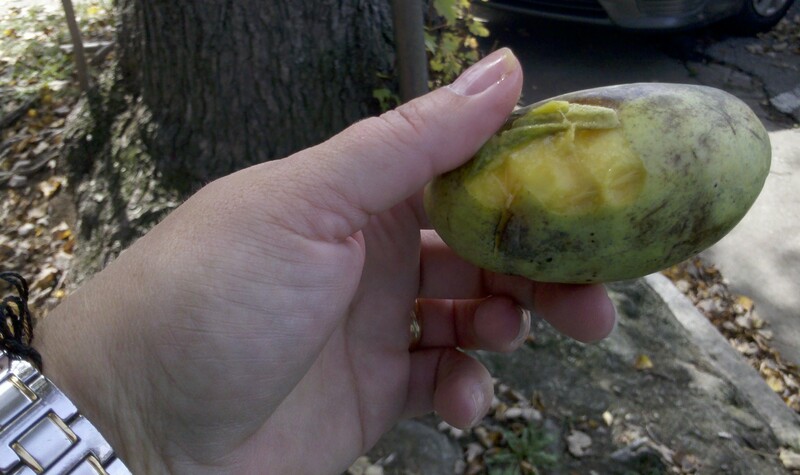 After scraping a bit of the skin off, I discovered the yellow flesh of the pawpaw. Apparently in Indiana, pawpaws are called Hoosier Bananas. It makes sense, given their mature size and shape, but I think the name Pawpaw is so much more endearing and just sounds so Huckleberry Finn somehow. Technically I was not yet Sasquatch when I had my first pawpaw. I was in Madison, Indiana for the Chautauqua festival when I ran into an acquaintance there. He had been hiking with family along The Heritage Trail (one of my favorite places to go write during my time in Madison) and they found a pawpaw tree. 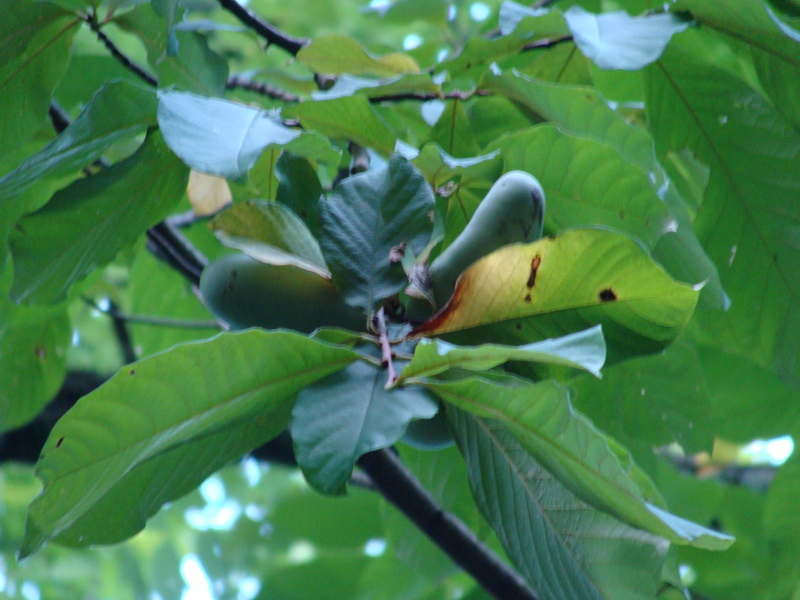 If you have been reading my blog for awhile, you might remember the first time I encountered a pawpaw (ha, “encountered?” Like it was going to rise up and attack me or something! Now maybe if it were a Hoosier Banana…). Anyway, I was hiking with that same acquaintance on Hatcher Hill when he pointed them out and was kind enough to pull a few down (unripe at the time of course). The inside of an unripened pawpaw. So it was kind of perfect that he was also the one to give me my first ripe one to try. The skin felt similar to a pear, and when I bit into it, I thought it tasted strangely like a cross between a pear and…well, um, a grape. Is that weird? It seemed awfully weird. Those two fruits are not at all in the same family, right? Although I was told to peel off the skin, I ate some of it anyway, since the interior tasted pear-like and the skin looked pear-like. And sure enough, the skin seemed to taste and feel pear-like to me. 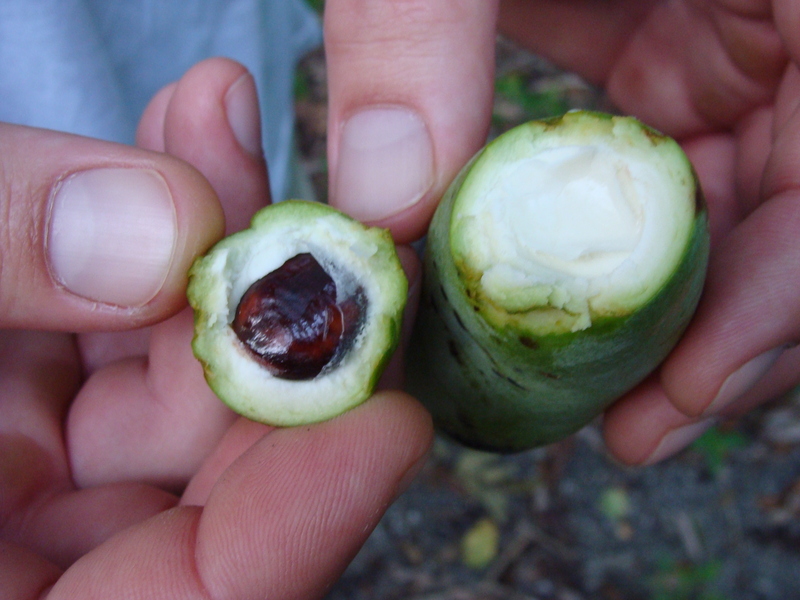 The interior was mushy, like a banana, and had big seeds, big enough to avoid or spit out (I chose the former). The fruit is native to the United States, as proven by fossil records. And apparently their range extends well into southwestern Pennsylvania, though I don’t ever remember seeing a pawpaw before. If I had found these growing up, I would have eaten every last one. I found it delicious and although the interior texture was mushy, I would wash and eat the skins. Or, I might make pawpaw jelly. Maybe mix it up with a little elderberries and grapes (since I swear it also tasted like grape to me). In any case, I hope to try them again and maybe make some delicious jelly out of it. Whatever I name my new concoction, I can assure you it will not be called Hoosier Banana Jelly. Used to go to a restaurant north of Tampa called The PawPaw Tree because one grew right through the middle of the establishment. Great fun! 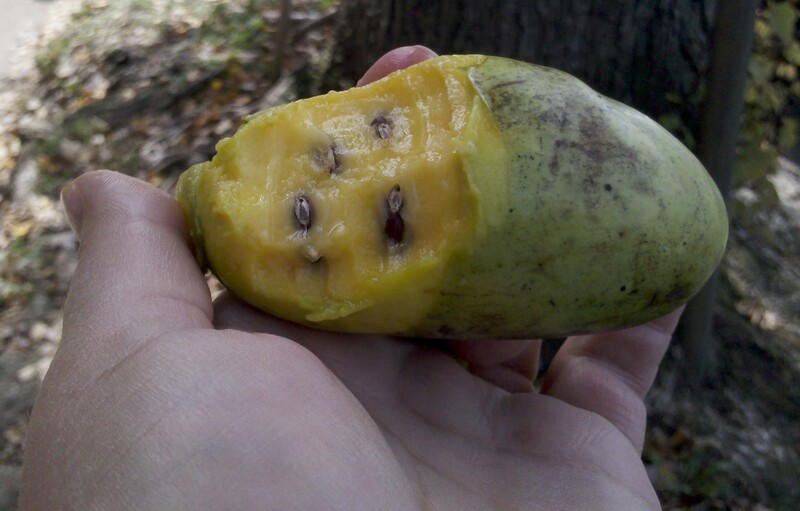 I had to google Paw Paw, never seen one let alone eaten, now I’m curious.